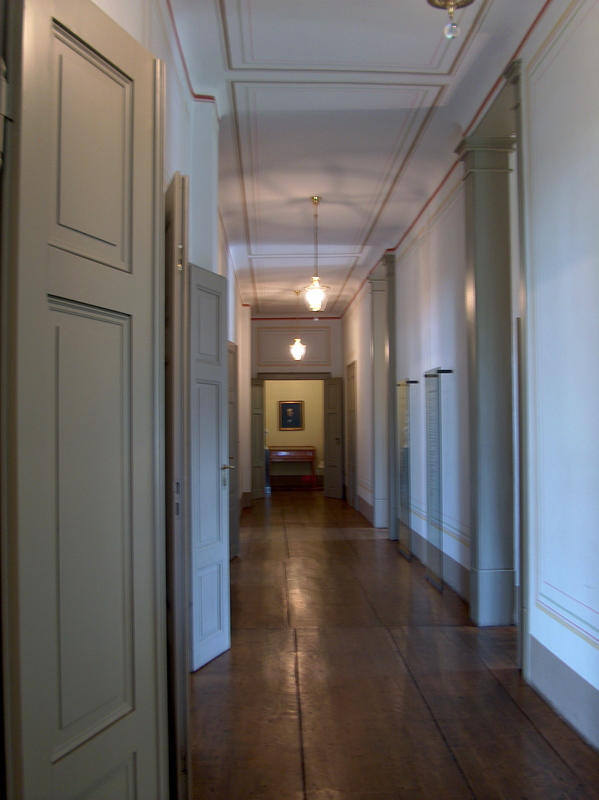 The hallway in the Mendelssohn home. 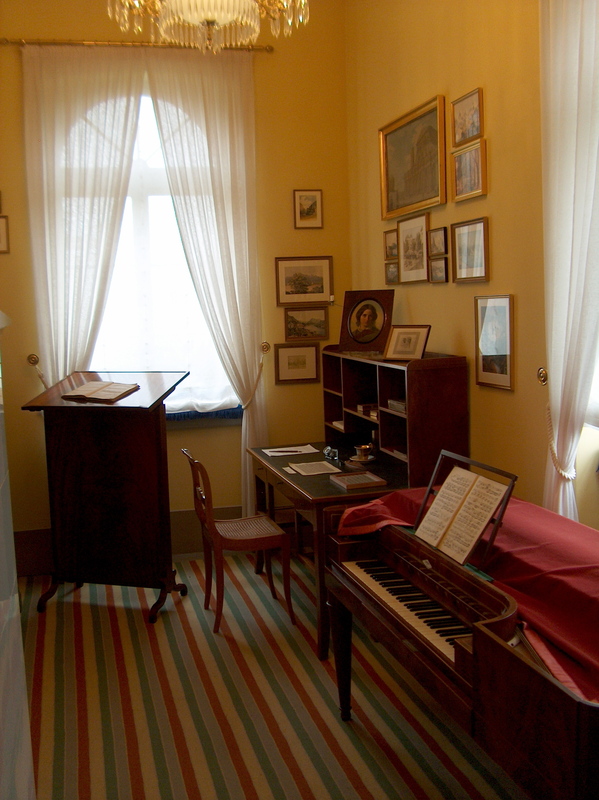 The small bedroom in which Mendelssohn died is at the end of the hall on the right. Mendelssohn was thirty-eight years old. Prepare yourselves to hear from me something unspeakably terrible and sad. 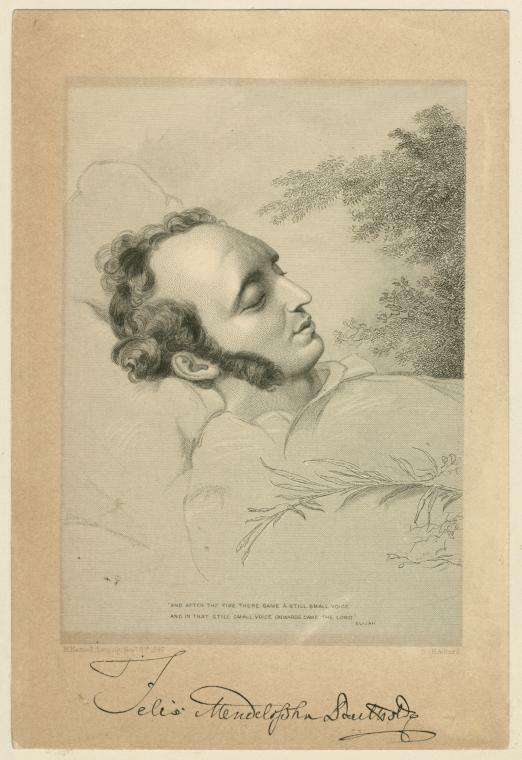 God Almighty yesterday afflicted me for the first time with a great misfortune; all my joys, all my hopes, everything, everything has been ruined since yesterday at 9 o’clock — Mendelssohn is dead! A world of sorrow lies in these three words; unfortunately, they are only too true. — Dead! dead! dead! — it is impossible for me to think of anything else, or to listen to even one note of music. Mendelssohn had been unwell for some time; 8 days ago he had a relapse, and he suffered a small stroke; nevertheless, the entire time we had the best hopes, until the day before yesterday, Wednesday, at two o’clock, when he had another, very violent attack, and things became more and more alarming. Yesterday evening the rattling in his throat began, and his strength gradually failed him, so that at a few minutes after nine o’clock he passed over into a more beautiful world, calmly as only an angel could do. I hold you as a thing enskied and sainted. Oliver Wendell Holmes wrote unforgettably about the permanence of misfortune’s impress: “Did you ever happen to see that most soft-spoken and velvet-handed steam-engine at the Mint? The smooth piston slides backward and forward as a lady might slip her delicate finger in and out of a ring. The engine lays one of its fingers calmly, but firmly, upon a bit of metal; it is a coin now, and will remember that touch, and tell a new race about it, when the date upon it is crusted over with twenty centuries. So it is that a great silent-moving misery puts a new stamp upon us in an hour or a moment, — as sharp an impression as if it had taken half a lifetime to engrave it.” [vi] So it was that the finger of anguish reached out and touched an entire community, leaving behind a myriad coinage, ineffaceably minted with the date in November, 1847 when they first learned of Mendelssohn’s death. 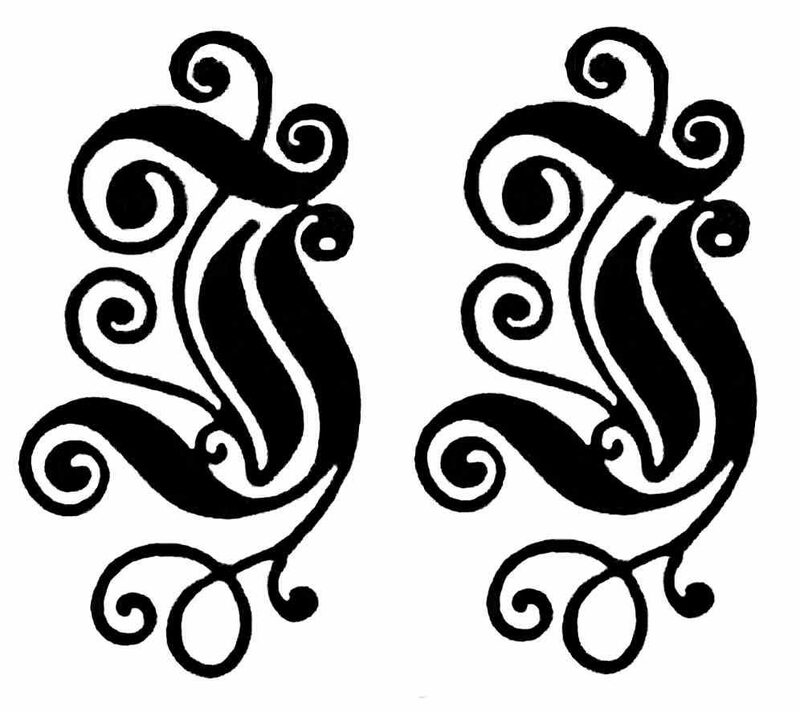 So, more or less, Schleinitz related it to me. It sounds cold as I have written it, but the way he told it to me it completely broke my heart. I could not console him, just weep with him; and that, honestly, is what I did. Those days, when I met friends, we pressed each others’ hands and everyone had to cry. 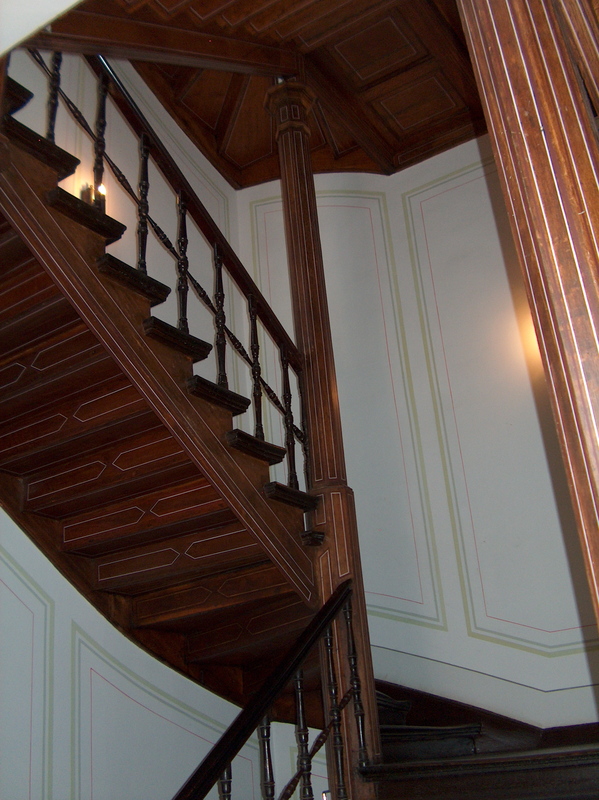 On Thursday evening, as many people as room would allow stood and wept in Mendelsson’s house, on the stair, and in the courtyard. No one could think of anything else. I was often at Schleinitz’s, I could not stay home; I had a great desire to see Mendelssohn in death, but there was no one who would go with me to see him. 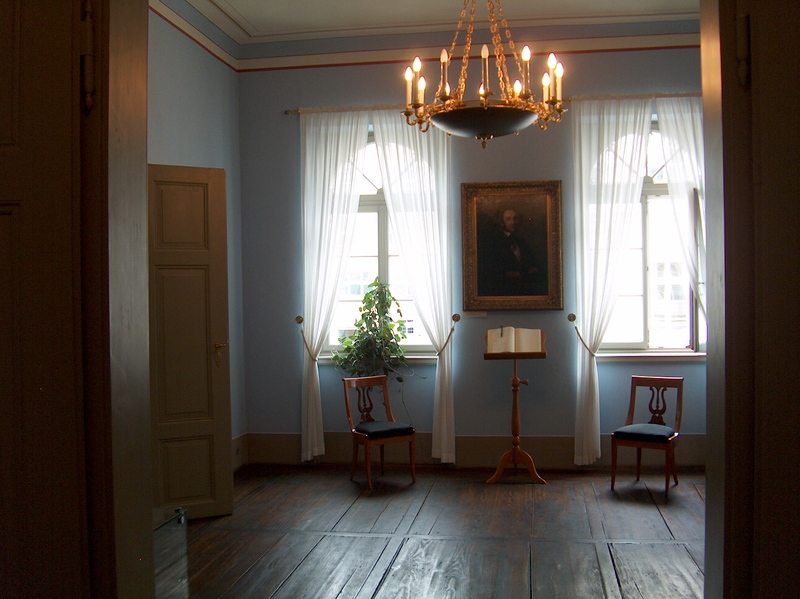 The Mendelssohns occupied the visible second floor. Eight days ago on Sunday, a very beautiful and dignified funeral was held for Mendelssohn, which was all the more fitting, since he was buried in Berlin and not here. 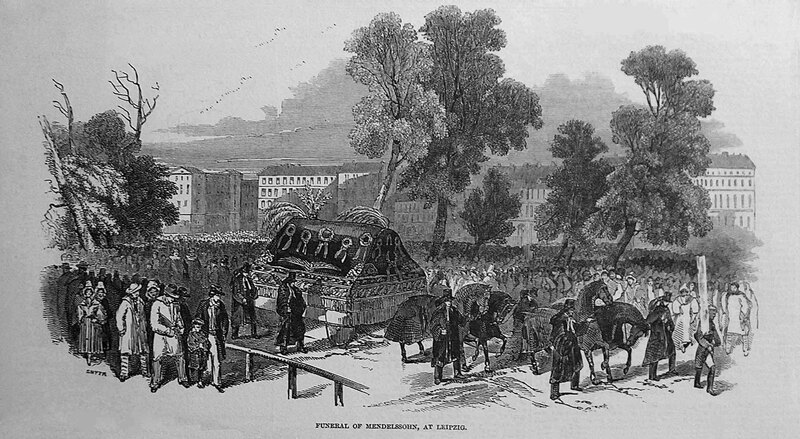 After the funeral procession had left the house on its way to the Paulinerkirche, with suitable music and a cortège that was longer than one can imagine, the adorned casket was positioned in the middle of the church, surrounded by candelabras, and a choir of 500, accompanied by organ and trombones, sang verses from the chorale O Haupt voll Blut und Wunden; the eulogy followed, then the beautiful chorus from Paulus Sie wir preisen seelig, the Benediction, and finally the last chorus from the Bach passion. The orchestra was of a strength commensurate with the choir; the whole thing had the most beautiful, uplifting effect, and it was truly remarkable that it had all been brought together in barely two days. Remarkable, too, the order and calm of the procession, since such an enormous mass of people crowded in, following and looking on. The ceremony was over around 6 in the evening. The casket remained in the church, and at 10:00 o’clock in the evening was taken by a special train to Berlin; it was received in Cöthen by music director Lang — in Dessau by Dr Schneider — with Männerchor singing. 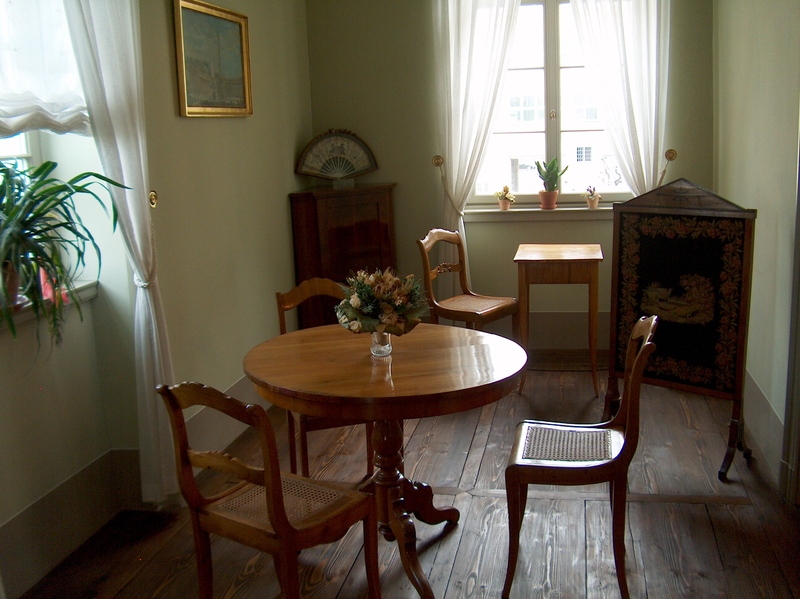 Mendelssohn’s family will remain through this winter in Leipzig, then probably move to Frankfurt, where the mother of his wife lives. 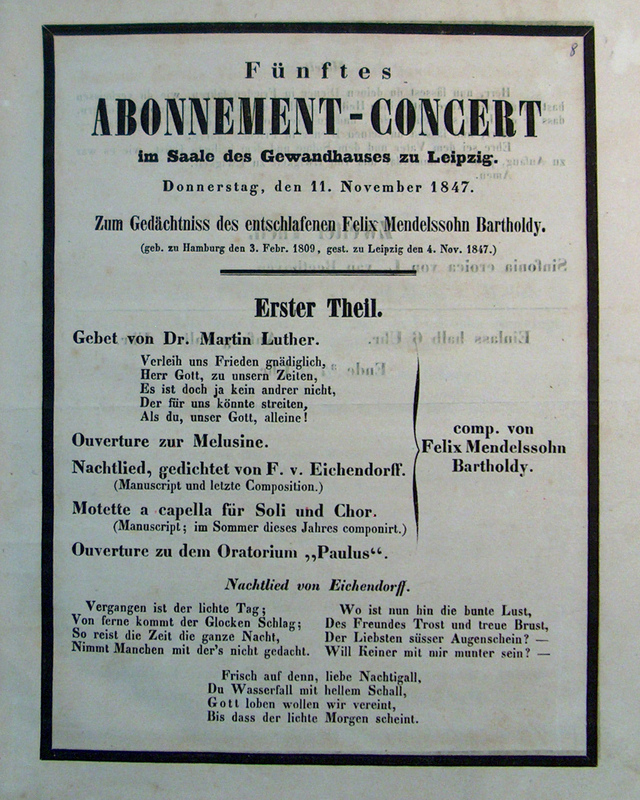 Today was the first concert after Mendelssohn’s death. It was very solemn — everyone dressed in mourning. This black-clothed throng looked indescribably serious. [Livia] Frege sang the song [Mendelssohn’s Nachtlied: Vergangen ist der lichte Tag]  very, very sombrely, which gave one the chills. After so many years of silence, Schleinitz sang the solo in the motet; in this hour, and in this music, his wonderful voice was more moving than anything else. I could not avoid the thought that Mendelssohn was listening today. Shouldn’t the spirits surround us here? — should their life be a slumber — no continuation of the earthly life? — I imagine that they see and hear everything as before, but they penetrate the causes of that which appears incomprehensible and painful to us here. Of all people, I cannot imagine Mendelssohn dead — not even temporarily asleep — for his spirit was so utterly compelling that he appeared to be made entirely of soul, entirely of spirit. Whenever he entered a rehearsal or a performance, a new life flowed into everyone; his eyes sparkled, every motion was elastic, stimulating, and always and everywhere this noble command, this outward as well as inward nobility. And whoever had never seen him before would have recognized him at first sight as a great spirit among thousands. And how every feeling found direct and lively expression on his face! No greater joy than to see him listening to music, for instance in a quartet that he did not participate in playing. Every thought of the unfamiliar music could be read in his face. How heartily could he laugh! One could not hear three words from him without there being a significant, a stimulating one among them. 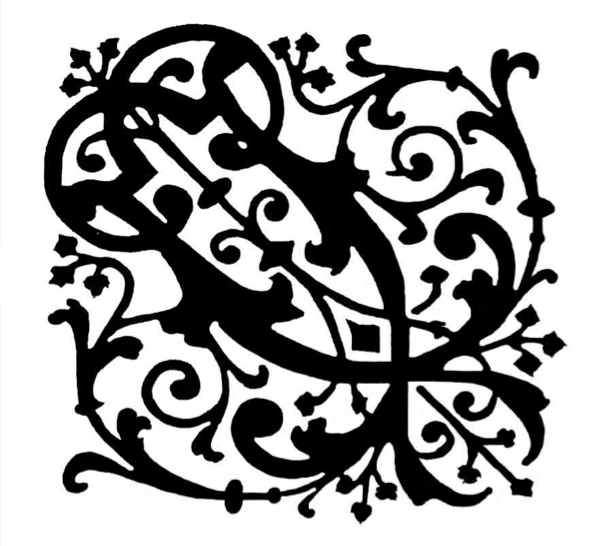 I always considered his praise the highest — he was the highest authority, the court of last appeal. If he had unjustly offended anyone — spoken of someone adversely to a third party — he could not rest until he had made amends. His behavior toward other living composers… When he had nothing to praise, he said nothing; but where he unmistakably found talent, he was the first to say so (thus in the cases of Bennett, Gade and Rietz). Did he feel that he had fulfilled his mission? Leipzig, which, as long as Mendelssohn was there seemed to me a paradise, has now lost its magic charm for me. — nevertheless! (It might perhaps astonish you) My dear father’s suggestion is something with which I am — not in agreement. When I received his treasured letter yesterday, I was greatly taken with the thought of once again belonging to you, my dear ones, and immediately made all kinds of plans about it; about my journey, etc. I have already gone so long without the great delight of seeing you all that in the beginning I could hardly give in to any other thought than the joy of it. But as little by little I calmed down, and began quietly and seriously to mull it over, I had unfortunately to admit that it would not agree well with my artistic development, and duty must take precedence over that ever-so-great satisfaction. — It is absolutely necessary for my reputation, my independence and also for my purse that I go next spring to England, as my best friends there expect. To this end, I plan to spend the few months that remain early next year to write a few pieces—this is absolutely necessary. Since there only remains until the end of February or the beginning of March, I would like to spend as much time as possible on it, and if I go to Pesth, I will lose much time with the trip back and forth, and I would barely be able to spend 2 1/2 months with all of you, irrespective of the fact that I would have not a single musical advisor there whose inspiration would assist me in my compositional work. — Also, as concerns my other studies, literature and Latin for example, I would hardly have such a dear friend and teacher as [I do] here, who is of such value to me, and with whom I am, so to speak, settled in, and who takes such pains for my education as a human being; and to be uprooted from here would certainly not be good for me. What’s more, I don’t believe that I, who have been spoiled by the good fortune of having the musical companionship of people like Hauptmann, Gade, Mendelssohn, could get used to keeping company with people like Hunyady, Kohn, etc.,  and if I could, I would certainly hold it to be an intellectual/spiritual step backwards, as you undoubtedly would also, dear Rechnitz. May I therefore trouble you with the request to tell me as soon as possible whether my motives appear right, for the advice of such a well-meaning, dear friend would be of the greatest value and service to me. — Also, I ask you to present and explain to my dear father and good mother my reasons which cause me not to spend this Winter in Pesth, since, coming from your eloquent mouth they will surely have genuine power and weight for them. Perhaps it will work out next year, when I hope to be more musically and intellectually developed, that I will fully come to Pesth; for I am sensible of how wholesome and beneficial it would be for me once again to live fully for those that I call my own. — Unfortunately, the post-hour strikes, and I must cease my conversation with you, my fatherly, much admired friend. Greet and kiss your loved ones. I thank your dear Hanni for her affectionate good wishes, which I return with all my heart. I will write to my dear parents soon, since today I can only still send filial and sincere wishes for their well-being, which is so precious to us. For such a kind, consoling letter I owe you a debt of thanks that I repay with my whole heart. It is indeed a good fortune that God in his benevolence has granted me such dear, good souls, whose sympathy comforts me so well, and whose love for me I learn more and more to recognize and to value. Here, everything that concerns music is now so desolate and empty, since the exalted spirit who was her guardian is departed from us. His works, which I study eagerly, are my most beautiful consolation, and I linger with heartfelt delight over them, to which I already owe so many transported hours. Whenever I go to the piano and play for myself a particularly beautiful passage in which his noble soul is so fully reproduced, it brings a rapture of melancholy such as I am incapable of describing in words. Joseph would stay on for several years in the city that had “now lost all its magic charm” for him. Continuing forward would require that he face significant challenges and make difficult adjustments. 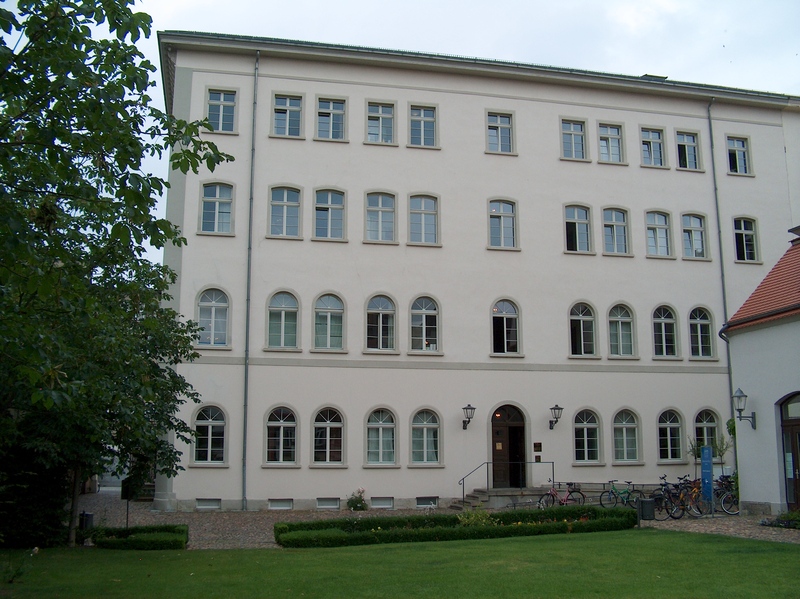 Gade lived near Mendelssohn at Königstrasse 16. Nimmt Manchen mit der’s nicht gedacht. Bis dass der lichte Morgen scheint. Taking with it many an unsuspecting man. Until the bright morning shines. [i] Music & Letters, Vol. 36, No. 4 (October, 1955) p. 375. 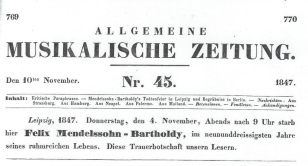 [v] Author’s translation based on German text in Reich/BETH EL, p. 67, amended from the English quoted from the Jewish Chronicle and Hebrew Observer in The South Australian Advertiser, Monday, October 31 1859, p. 3. [vi] Oliver Wendell Holmes, The Autocrat of the Breakfast-Table: Every Man his own Boswell, Boston: Houghton, Mifflin and Company, 1894, p. 38. [vii] Litzmann/SCHUMANN II, p. 171. [ix] Hauptmann/SPOHR, pp. 30-31. m.t. [xi] This is in Creuzburg/GEWANDHAUS, opp. p. 82. [xiv] Ernest Walker, quoted in Demuth/ANTHOLOGY, p. 212. 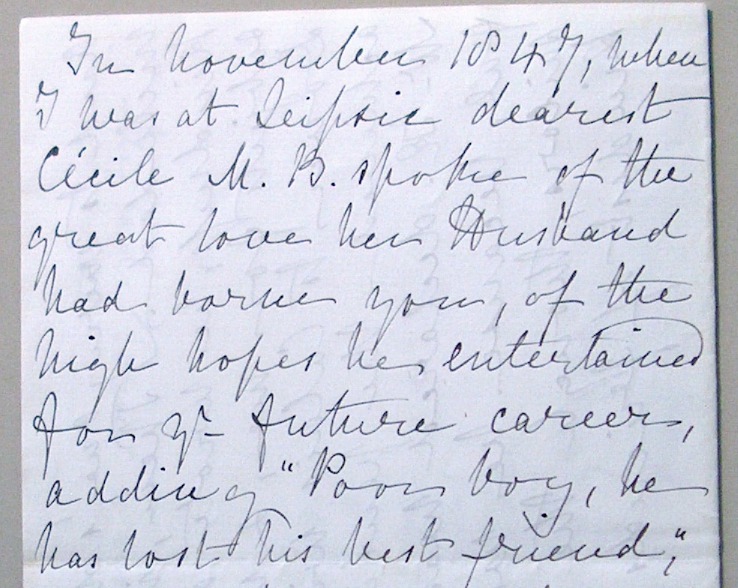 [xv] Sophie Horsley to Joseph Joachim, Kensington, March 17, 1889. Holograph in Staatliches Institut für Musikforschung Preußischer Kulturbesitz, Berlin. [xvi] The Musical Times, Vol. 39, No. 662 (April 1, 1898), p. 226. 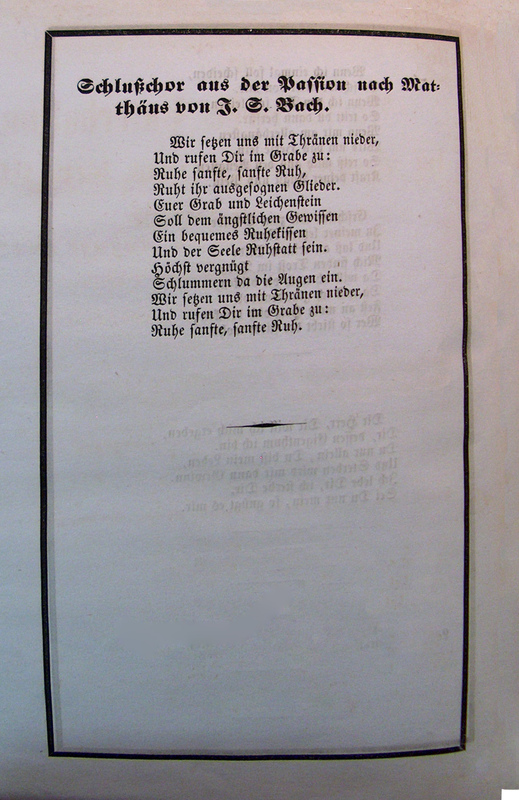 [xix] See: Friedhelm Krummacher, Mendelssohn — der Komponist: Studien zur Kammermusik für Streicher, Munich: Wilhelm Fink Verlag, 1978, p. 83.